April 17th – We sit by the pool until it’s time to head to Ben’s farm. We take the fifteen minute journey down a winding dirt road and have to get out and walk the last mile because our bus won’t fit on this path anymore. We arrive and are greeted by two black labs. We go inside the magnificent, brightly painted yellow gate, to see olive trees extending as far as we can see, with horses, chickens and black labs milling around the front area. They all seemed to roam freely together, and aside from a few animals, none were really caged in separate areas or locked up in pens or barns. The first thing we do is make lunch. Ben serves us goat cheese with bread and olive oil, which we eat at an outdoor wooden picnic table. When we’re done, Ben brings us some fresh vegetables from the garden – zucchini, spinach, carrots, squash, red peppers and potatoes. We all pitch in washing and cutting the vegetables. We put the scraps into a bag for the rabbits. Ben shows us the three ceramic stoves on the ground – the highest one is Indian, then the middle level is an Arab style oven and the one on the ground is a Jewish style oven. We place the freshly cut vegetables into a colorful display in the tagine bowl on the table. I do the honors of placing the cone shaped cover over the tagine and after Jenny helps light a fire, we place the tagine onto the Jewish style oven. While lunch is cooking, we go out onto the farm. It is line with olive trees and there are small burrows for the rabbits beneath the trees. We see more and more animals – rabbits, ducks, swans and more chickens as we make our way towards the back of the farm. Ben talks about the mating habits of the rabbits. He shows where they line up at night, and that when it rains, he can expect a lot more baby rabbits. We hold a baby bunny. He shows us the olive buds up close. He uses no pesticides on his farm. Ben explains that if you are good to nature, it is good to you. And we have to stop taking so much and start giving some back. He talked about building a few small huts out in the fields and allowing people to camp in them overnight and just enjoy nature as it is. We walk back past the horses and over to Ben’s shed and there is a beautiful white stallion. He tells us this stallion makes him a lot of money. Then he takes us to a small shed, where we see twelve adorable baby labs. We step right into the puppy den, and start picking up the little yellow and black labs – their mother is a yellow lab, and father is a black lab. They are the most amazing puppies I’ve ever seen – and so many at once! After taking tons of photos and watching the puppies nurse from their mother, we are able to pull ourselves away from the pups to go eat the lunch we have prepared. 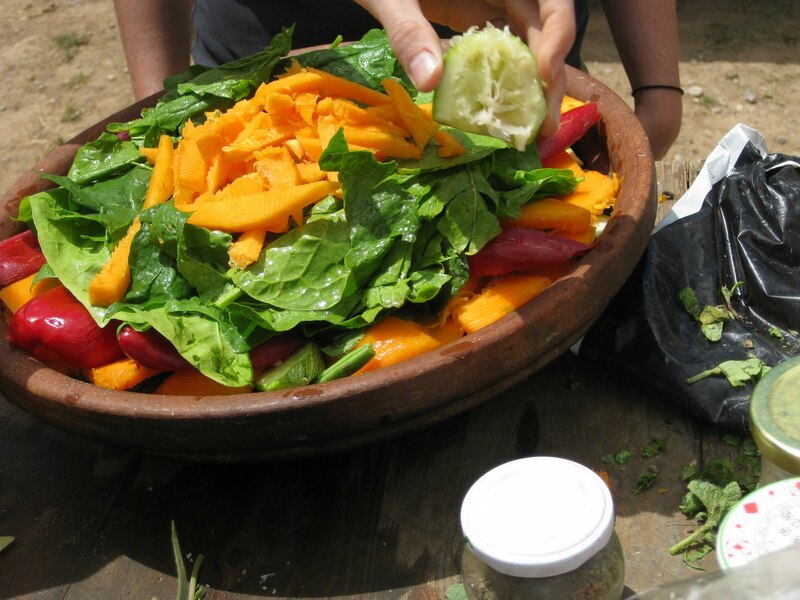 We walk up onto a colorfully painted terrace overlooking the entire farm to eat. The completed tagine was absolutely delicious. We learn a bit more about Ben during this meal- he was born in France and grew up in Australia. His brother still lives in Australia, and runs two Earth Café’s there. 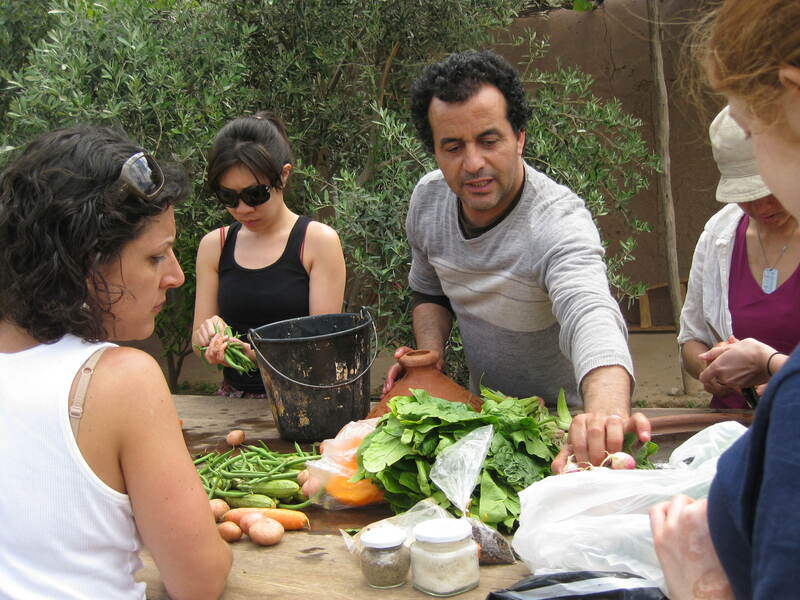 Erin, a board member from San Francisco, is also a restaurant owner, and she found it fascinating that in Ben’s five years of being in Morocco, he had done so much with the farm and his restaurant. Today happened to be Erin’s birthday and the farmhands came upstairs with pastries and lit a candle for her. Then they presented her with a beautiful bouquet of roses. After the food and the birthday celebration, we took a quick visit to the olive press to see how olive oil is made. After saying goodbye to Ben, we head back to the hotel to get ready for dinner. For a minute back in our room, we turn on the BBC since it’s the only English speaking channel, and we see that earlier this morning, a dormant volcano in Iceland has erupted for the first time in 200 years. All of Europe was covered by a cloud of dust, and every airport from Switzerland to Spain, had closed. Half our group was planning to head home through European airports. We weren’t leaving for another three days, but everyone grew concerned. Jenny actually stayed home from dinner that night to work out her travel – as a flight attendant, she always flies standby and all the flights she was hoping to get on were now full. We go to a Thai place for dinner that night. Like every other restaurant, the décor was grandiose, with intricate mosaics running from floor to ceiling with a huge, ornate lantern hanging in the middle. There is a fire pit in the middle of this restaurant and during the first course, the music gets overwhelmingly loud, and right next to the fire pit we see a Michael Jackson impersonator on stilts, dancing to Billy Jean. Very authentic Moroccan. Later, a fire eater does a performance for us, and then a drummer. Our group goes into the middle of the restaurant and starts dancing during the drummer’s performance, and I take a tambourine from the restaurant owner’s hand and play it alongside the drummer for the remainder of the night. 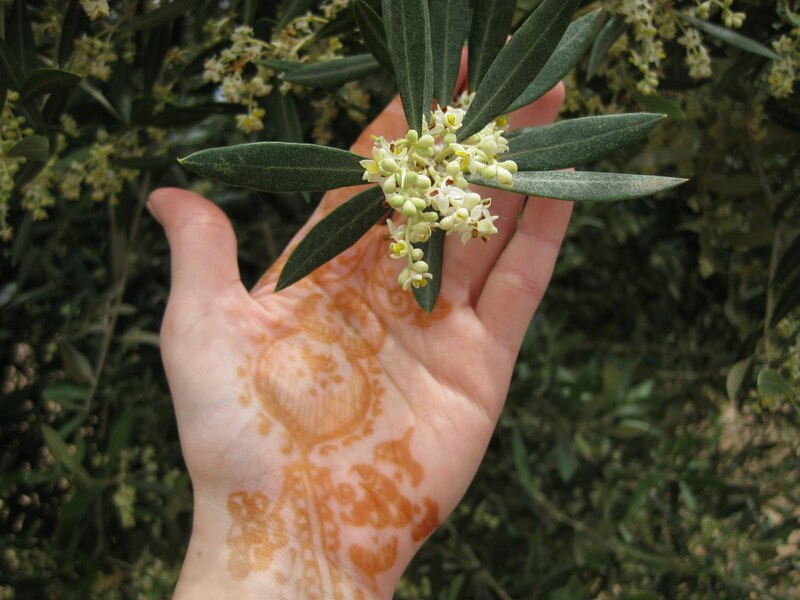 This entry was posted in change the world, morocco, travel and tagged earth cafe, farm, marrakesh, morocco, olive oil, puppies, tagine by Amy Schoenberger. Bookmark the permalink. suppose you were to create a killer headline? I ain’t saying your information isn’t solid. , however suppose you added a title that makes people desire more? I mean Morocco, Day 7 – The Farm | Amy Hit the Atmosphere is a little vanilla. You should glance at Yahoo’s home page and note how they write news headlines to get viewers interested. You might try adding a video or a related picture or two to grab people excited about what you’ve written.